Since Small Smiles is no longer a Medicaid provider in New York one mother asked for her child’s records. 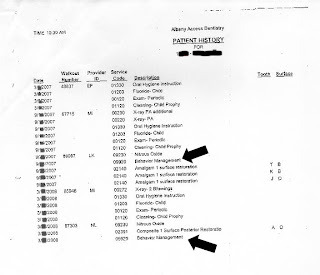 What she got were x-rays and nothing more than a spreadsheet of sorts, listing dates of visits, (every 6 months regularly), procedures, service codes for billing Medicaid, and initials of doctors who did the work. Looking over the so called medical records (1 full year of them) a pattern clearly emerges. Exactly 6 months later the child returned, got the same as above with added x-rays and low and behold cavities were found because the next week the child was in for 3 filling! Three!! Wonder how they missed those on the first visit, or do you think the hygiene instruction wasn’t clear for the child to have gotten that many cavities in that short of time. By the initials of the dentist, Dr. Laura did these fillings. Another 6 months pass, more hygiene instruction, fluoride, exam, and cleaning and there again, they found another cavity. This time it was Dr. NL who did they work. All this doesn’t say much for Small Smiles “hygiene instruction now does it”. Since Small Smiles tries to keep their torture clinics friendly they just use the first names of the doctors, Dr. Laura for example so this mother has no idea what the real name of the dentist actually could be. She was told they did NOT use a papoose board on her child. She asked since her child came out very upset and said the dentist was “mean”. Yet according to this “record” behavioral management” of some type was used and it appears billed Medicaid for doing so. So they are lying to someone, either they used the papoose board and lied to the mother or they billed Medicaid for something they didn’t do. She is also concerned, and rightfully so, that these records seem to be a bit incomplete to say the least! Where’s the notes taken during the exam there has to be more than a tiny spread sheet don’t you think! This is not long ago people this is current stuff, so don’t by the sales job they are trying saying they are “improving” anything cause they aren’t improving anything. I’m wondering if Small Smiles/Albany Access Dentistry even have this child’s original records, documents showing where this child’s mom signed consent for anything at all to be done, where is all this stuff, could be in a heap of shredded documents for all we know. I’ve been at this for months with these people and I’m not seeing any improvement, even with the Fed’s snooping through the records across the county nothing is getting a bit better!